The Remote Control window defines the functionality of the remote control device being used. The Preset button can be used to load predefined presets, or to create new presets. The Info button shows information on the current settings if available. Use the Device button to select the MIDI devices corresponding to the remote control device. The Clear button clears the highlighted Action. The None preset can be used to clear all actions. If the Learn button is engaged any incoming midi messages will be mapped to the highlighted Action. Custom mappings can be created easily this way. The Mixer Sections settings will typically equal the number of channel strips the remote provides. The highest possible value is 64. The Effect Sends settings determines the number of Effect Send knobs that can be controlled using the remote. There can be multiple Views. This is typically used to control multiple Actions using a single rotary knob (View 1 = Pan, View 2 = Effect Send 1 etc.). The All Views button makes the highlighted Action appear in all views. You'll probably want volume faders, transport buttons etc. to be in all views. The Effect Knobs settings determines the number of rotary knobs available for controlling effect knobs. An effect can only be controlled when its user interface is visible on the screen. The knobs used to control effects can also be used to control mixer sections (pan knobs etc. ), MultitrackStudio takes care of this automatically (there's no need to use views for this). The following actions can be controlled by the remote. Actions marked (cc) should be controlled by a continuous controller (rotating knob or fader), all other actions are supposed to be controlled by a button. What Is: Keep this button down while using another button or knob. A description of the associated Action will be shown in the bottom left corner of the screen. Start/Stop: equivalent to hitting the space bar. Cycle: toggle cycle on/off. Start will do Start Cycling instead if Cycle is on. Set Cycle Start: set start of cycle region (uses the current transport position). Set Cycle End: set end of cycle region (uses the current transport position). Counter: turn on/off remote's counter display. To Next Song: to next song of songlist. To Song (cc): to song of songlist (zero = first song). To Song High (cc): adds another 7 bits to the 'To Song' action, so more than 128 songs can be used. 'To Song High' must be sent before 'To Song'. The song number is calculated as like this: song = 128 x 'To Song High' + 'To Song'. Alternate Take: click the Recording option's Alternate Take item. Re-Arm: engage the Rec buttons of the last recorded tracks. Soft Monitoring: click the Soft Monitoring button. Punch: click the Punch button. Section Play: toggle a track's Play button. Section Rec: toggle a track's Rec button. 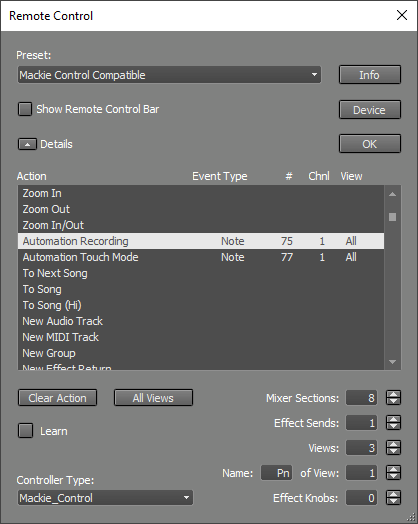 Section PlayRec: toggle between playback and record mode. Section Practice Mode: switch track to practice mode. Section Half Solo: toggle between half solo and no solo. Section Slot: open an Effect Slot (show the effect's user interface). Section Editor: open/close a track's editor. Section Set Punch In: make start of the editor's selected part equal to the Transport position. Section Set Punch Out: make end of the editor's selected part equal to the Transport position. Section Set Punch In/Out: select the editor's selected part while the Transport is running. This should be done before recording. Section Goto Punch In: make Transport position equal to the start of the editor's selected part. Section Goto Punch Out: make Transport position equal to the end of the editor's selected part. Section Clone: add track with new file and similar settings. Section Map: pop up selector to map a mixer section to remote control channel. Master Fader: controls the Master section's volume fader. Clear Solo: turn off any active Solo buttons. Faders Silent: suspend/resume motor fader control. Can be used to keep the (automated) faders from making noise while recording in the same room. Slot Select Button: press this button before pressing the Section Slot button. Now a Section Select Slot action will be sent instead of a Section Slot action. Mouse Control (cc): controls the knob the mouse points to. Send Snapshot: send all values to the remote (probably never needed). The following actions are used to control Effects and Instruments. These actions can share knobs with non-effect actions (eg. Effect Knob and Section Pan can be on the same knob, Effect Bank Up and View Up can be on the same button etc.). Effect Knob (cc): control an effect's knob. Effect Control Map: pop up selector to map an effect control to a remote control knob. Effect Mouse Control (cc): controls the effect knob the mouse points to. Effect Close: close the effect window. Effect Bypass. Also used for instrument channel, it can be (cc) in this case. The following actions are used to select effects, sampler patches etc. These actions can share knobs with actions which are not in this group (eg. Selector Accept can be on the same button as Effect Close). Selector Accept: also used to invoke message dialog 'OK' or 'Yes' buttons. Selector Cancel: also used to invoke message dialog 'Cancel' or 'No' buttons.